Nearly all of us have been at this desperate place. Our souls are brittle and dry. All our prayers seem to bounce off the ceiling. They fall lifelessly to the ground and come to rest at our feet as bitter reminders of our failure and spiritual impotence. Like every other great blessing from God, prayer has its origin and power in the Father's grace. Thankfully, the power of our prayers is not dependent upon our feelings, our perceptions, or our choice of words. The power of our prayers rests in the hands of the Holy Spirit. The Spirit — as the Helper, Advocate, and Comforter — intercedes for us with our Father. Our Comforter articulates what we cannot say and captures the emotions we cannot verbalize. Our Advocate takes our prayers before the Father after his work of perfecting our words and emotions. He then intercedes for us according to the Father's will. Prayer, then, is not just a spiritual discipline, but also an incredible gift of our Father's grace. 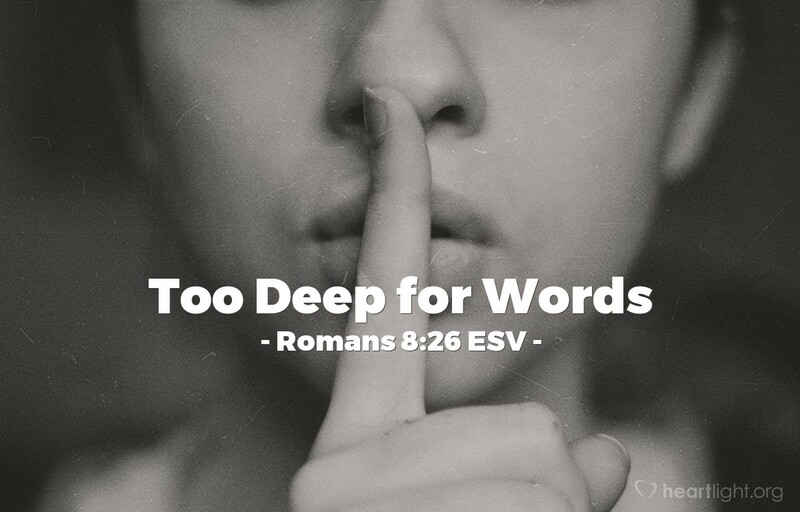 The Spirit assures us that we will always be heard and that our deepest longings will always be understood by the Father who loves us and always longs to hear the cry of our hearts. O Father, I praise you. Because of the intercession of the Holy Spirit in this very moment, I know that you hear more than what my words say. You know what's on my heart. You know my doubts, my insecurities, my secret sins, and my frustrating struggles. And, dear Father, you know my deep desire to have these things redeemed and transformed by your grace so that I live for your glory. I thank you for your grace, in the name of Jesus. Amen. God's Holy Fire is a daily devotional about the work of the Holy Spirit in our lives. The Thoughts and Prayer for God's Holy Fire are written by Phil Ware. Scripture quotations marked MESSAGE are taken from THE MESSAGE, copyright © 1993, 1994, 1995, 1996, 2000, 2001, 2002 by Eugene H. Peterson. Used by permission of NavPress. All rights reserved. Represented by Tyndale House Publishers, Inc.
Get God's Holy Fire by EmailJoin 1/4 Million Daily Readers!